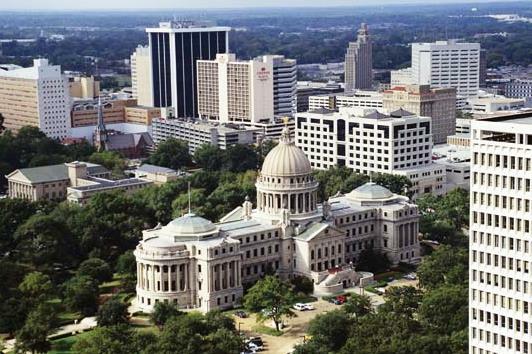 Mississippi became a state December 10, 1817, the 20th state admitted to the Union. Selected as capital because it is in the center of the state, the city also served as Confederate state capital, until Sherman reduced it to ashes. It then had the ironic name of “Chimneyville.” Carpetbaggers reigned here until 1876 and Jefferson Davis made his last appearance here in 1884. The new capitol was built in 1903, patterned after the national capitol. There are Civil War battle sites and many Confederate monuments in the area. At the Mississippi Petrified Forest are logs deposited as driftwood by a prehistoric river. The old-time friendliness and charm, where a smile is really a hug and contentment ranks higher than cotton; the rocking chairs and easy pace; the music and the stories that so poignantly express the hurts and the joys of then, and now. Mountains near: Foothills of Appalachian Mountains. Woodall Mountain, in the northeast corner of the state, is the highest point in Mississippi at 807 feet.